Tom Dorchester was born in the Angus Ridge district in 1911, grew up there and then lived most of his adult married life at Westerose. 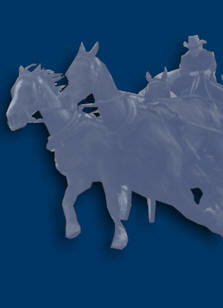 At the age of eleven he rode a horse in a race in Wetaskiwin and won. He credits this win for his lifelong desire to race horses. In 1933 he started racing cart teams and rode race horses at local competitions. but it was in 1939 that he ran his first chuckwagon race in Rimbey and it was the love of this sport that kept him pursuing wins for the next 42 years. 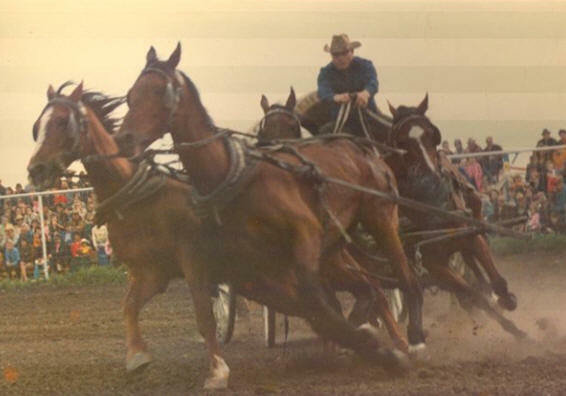 Besides chuckwagon racing, in his younger days he competed in chariot races, flat horses and Roman races winning many of these events at both the Ponoka and Calgary Stampedes. 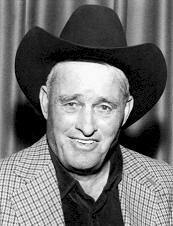 His first chuckwagon win occurred in 1944 at the Calgary Stampede, outriding for Theo Thage. He started driving regularly in 1949 but it wasn’t until 1970, after 21 years driving his own rig, that Tom finally won the Calgary Stampede, a feat he repeated the next year. 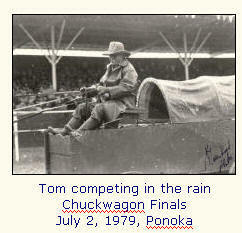 For six decades Tom competed in Alberta, Saskatchewan, B.C., Manitoba and Ontario as well as the United States, and during his career he had over 60 chuckwagon wins including five Central Alberta Championships (1960,66,69,71,72), four World Championships (1966,69,70,71), and one North American Championship (1976). Competing in the different races was not without risk and during his career Tom suffered some terrible injuries. In 1946 he was run over in a chuckwagon wreck in Red Deer. Another set-back occurred in July 1973 when he broke his back in a chuckwagon race at Morris, Manitoba. That year he was leading in the Canadian Chuckwagon standings and still ended up second. The next year, he set a record for the fastest time at the Calgary Stampede, apparently undaunted by the injury the year before. 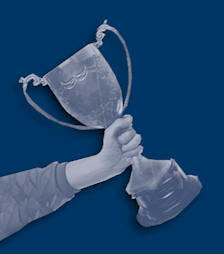 Because of his longevity, championship wins, and contributions to his sport, Tom received many awards and honours. In 1973 the Canadian Professional Rodeo Association named him “Cowboy of the Year”, becoming the first chuckwagon driver to receive this award. That same year, the Wainwright Stampede paid tribute to Tom and his wife, Joy, for their contributions to chuckwagon racing, by having a “Dorchester Night,” an event repeated by the Ponoka Stampede in 1990. Red Deer recognized Tom in 1974 for his outstanding contribution to rodeo. The Lakedell Agricultural Society honoured Tom and Joy for their contributions to the community and rodeos across North America in 1976. In 1982, Tom was presented with the “Pioneer of Rodeo Award” by the Calgary Stampede for his contributions to racing for over 50 years. In 1984 Tom was inducted into the Canadian Cowboy Hall of Fame, again the first chuckwagon driver to be inducted, and in 1986 the Ponoka Stampede awarded him with a lifetime membership for 50 years of competing at Ponoka. “Chuckwagon Person of the Year” the highest award of the World Professional Chuckwagon Association. In 1987 he was chosen “Chuckwagon Person of the Year” the highest award of the World Professional Chuckwagon Association. Tom also raced and won in front of Queen Elizabeth (1973 Calgary), was in the Grey Cup parades in Vancouver (1974) and Hamilton (1977) and was chosen as “Parade Marshall” for the Calgary Stampede Parade (1982). He also organized the first ever chucksled races for the Wetaskiwin Winter Carnival. Tom last competed as a driver at the Calgary Stampede in 1981, retiring at the age of seventy. Tom’s passion for his sport was passed on to his sons and grandsons and to his pleasure, he was able to compete with and against his sons. 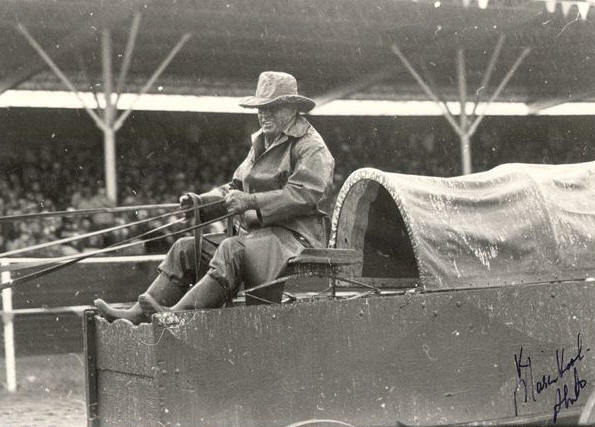 Because of his involvement in the sport of chuckwagon racing, Tom Dorchester brought distinction and worldwide recognition to Alberta, Wetaskiwin and his home community of Westerose. Read the opening comments made by Sandra Wright when introducing Tom Dorchester.